At CryoAction, we understand that nothing is quite so frustrating as being unable to do what you really want to, especially in sports. Maybe you want to train for the next match, but your body aches all over and you can’t afford to hurt yourself pushing too hard. That’s where we come in. With our revolutionary wellness cryo spa therapy, we can help you get back on your feet in record time, ready to face the new day with energy and enthusiasm. Interested? Please call us on 0800 014 8058 or send us an email enquiry via info@cryoaction.com. As the name suggests, the basic principle behind our new cryotherapy spa is simple: we make you very, very cold, and your body’s natural processes do the rest. 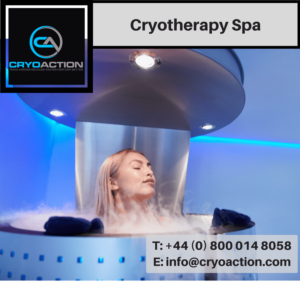 Through the use of frozen nitrogen and a set specialised spa chambers we can expose you to temperatures well over a hundred degrees below zero, walking you through a series of different settings depending on your individual needs. How long the treatment takes can vary, but in general you can expect to spend anywhere from a few seconds to a couple of minutes inside any given chamber. Exposure to such low temperatures for an extended period can be unpleasant, but don’t worry! We provide full protective gear to all of our clients, and you’ll never go into one of our cryotherapy spas without a trained attendant on hand to make sure everything operates smoothly. How does a Cryotherapy Spa work? There are many benefits from using a cryotherapy spa. Your body is a remarkable thing, capable of adapting to a wide range of temperatures and environmental conditions through a process known as ‘homeostasis’. When you lower your temperature to such an extent, your body kicks that process into overdrive, expanding your blood vessels and releasing chemical endorphins into the blood stream. Not only does this provide significant health benefits, it also feels great! What are the benefits of a wellness cryo spa therapy? Cryotherapy has two main application at present, though scientists are hard at work studying the technique for potential use in other fields. First, it greatly accelerates the rate at which you recover from muscular strain, soothing aches and pains and letting you get over a hard game or training session in record time. Secondly, it stimulates the production of collagen, leaving your skin feeling tighter, smoother and generally healthier. As part of a specially designed beauty regime, cryo spa therapy can leave you looking younger and feeling rejuvenated, purely by encouraging your body’s natural processes. It may sound like science fiction, but we assure you, cryo therapy is quite real, and so is CryoAction! Why not give us a call on 0800 014 8058 or alternatively, please email info@cryoaction.com. Alternatively, please fill in the form below and we will get back in touch as soon as possible.